The Hebrew word for man is ish (א’ש,) spelled aleph, yod, shin. Remove the yod and you are left with the letters aleph + shin, which form the word esh (אש) meaning FIRE. The yod is the first letter in G-d’s Divine Name YHVH ( הוה’ ). In removing the yod (‘) from ish (man), that is, if the Divine Presence is removed from man, he is left with the FIRE of his natural passions. 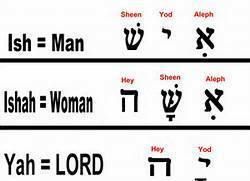 Similarly, the Hebrew word for woman is ishah (אשה), spelled aleph, shin, heh. Remove the heh, also a letter in G-d’s name YHVH ( הוה’ ) and, once again, you have esh (אש), and only FIRE is left. The yod and the heh together spell YAH, another form of God’s Name. Man and women together are (א’ש ו אשה). When a man and a woman come together in marriage and don’t bring Yah, the Divine Presence of G-d, with them they are only fire and fire (אש ו אש). A fire can be productive in providing passion, warmth and light or, if not controlled, can bring great destruction. With the loving balance and guidance of the Divine Presence of G-d in the marriage of a man and a woman, the fire remains constant and bright but does not consume. This entry was posted in Hebrew Words and Phrases by Keren Hannah. Bookmark the permalink. Very thought provoking and also very true. Thank you. Thank you for this gold nugget. Great way to revise my Hebrew also! The thing I love the most about the Hebrew language is the never ending depth of meaning – yes a gold nugget here!